The lungs are responsible for taking in oxygen-rich air for the body and eliminating carbon dioxide. The pair of organs in the chest work this exchange through the alveoli, small sacs that looks like clusters of grapes. These sacs provide a large surface area so the exchange of gases to and from the blood can occur. 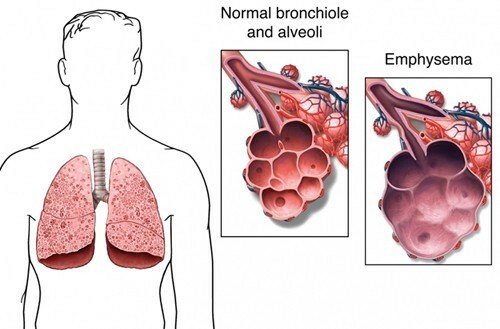 With emphysema, the alveoli are weakened and eventually rupture, greatly reducing the surface area of the lungs and creating a large air space but insufficient for air exchanges. The damaged alveoli no longer function properly, trapping carbon dioxide and leaving little room for the needed oxygen-rich air. Emphysema is an incurable condition, though proper treatment may alleviate symptoms and slow the disease’s rate of progression and damage. Emphysema is a progressive disease that causes shortness of breath. The air sacs and other lung tissue responsible for the exchange of oxygen and carbon dioxide in the blood are severely damaged or destroyed. Emphysema is one of a few diseases grouped as Chronic Obstructive Pulmonary Disorder or COPD. It is an obstructive disease because the damaged alveoli cannot eliminate carbon dioxide, thus preventing oxygen from entering the lungs. The destruction of lung tissue permanently alters the organs’ anatomy. Small airways called bronchioles that aid in the elimination of gases collapse when the tissue surrounding them is destroyed and the gas becomes trapped in the alveoli. This slows or even stops breathing. Normal lung tissue is pink and resembles a new sponge. Lungs damaged by emphysema become dark with large holes, and lose their elasticity. The lungs expand during inhalation and then naturally relax on exhalation. The natural elastic function is impaired, trapping air and preventing the release of carbon dioxide. Emphysema’s destruction of healthy tissue affects the tiny capillaries and bronchioles. This, in turn, affects blood flow that would normally receive oxygen as well as destroying the alveoli. What Are the Symptoms & Complication of Emphysema? The symptoms primarily seen with emphysema include shortness of breath, rapid and shallow breathing, wheezing, appearance of a barrel chest, a chronic cough, decreased tolerance for exercise or other physical exertion, and weight loss due to decreased appetite. Eventually emphysema leads to respiratory failure. Aside from the symptoms above, emphysema can have other complications. These include pulmonary hypertension, which is high blood pressure in the lungs’ arteries, and pneumothorax, which is a collapsed lung and can be fatal due to the weakened state of the lungs. Infections such as the common cold, flu, and pneumonia can occur repeatedly. The development of empty spaces in the lungs can occur, called giant bullae, taking up large areas of the lung. These giant bullae can become infected, causing pneumothorax. When pressure in the arteries connecting the lungs and heart increases, this creates a condition known as cor pulmonale in which the heart expands and weakens. What Are the Causes & Risk Factors of Emphysema? Emphysema is the result of damage to the air sacs or alveoli of the lungs that is irreversible. For most people the diagnosis of emphysema is the result of smoking. It isn’t clear yet how smoking destroys lung tissue but studies indicate that smokers are six times more likely to develop emphysema over non-smokers. It is also believed that second-hand smoke may contribute to emphysema. Exposure to second-hand cigarette smoke is known to damage the lungs, and those with higher amounts of exposure, such as those who live with smokers or work in an environment where smoking is permitted, are at higher risk of emphysema. Another major cause of emphysema is a deficiency in a substance called alpha-1 antitrypsin, though smoking is still a far greater cause. Alpha-1 antitrypsin is a naturally occurring protein found in the blood which keeps white blood cells from causing damage to healthy tissue. White blood cells fight infection by destroying invading bacteria. Continuous damage can occur to the lung tissue by the white blood cells because of the deficiency of this protein. A deficiency of alpha-1 antitrypsin is usually caused by a genetic condition. The result of combining this with smoking is catastrophic to the lungs. Factors that can increase your risk of developing emphysema, except smoking and exposure to second-hand smoke as described above, are charted below. While lung damage occurs gradually, those at risk for emphysema usually see the start of symptoms between the ages of 40 and 60. Chemical fumes and dust from such products as wood, cotton, grain, or mining products can increase your risk of emphysema. Indoor pollutants such as heating fumes and chemicals found in carpet or paint and outdoor pollutants such as exhaust fumes can lead to emphysema. This is the most important thing you can do to slow the progression of emphysema. There are a number of cessation tools and available to help you quit. Avoid fumes from chemicals and other substances, including candles and incense and change your air conditioner and furnace filters regularly. Exercise regularly can help increase your lung capacity, keeping them healthy. Wear a scarf or mask in cold weather as cold air can cause spasms to the bronchioles making it difficult to breathe. Avoid contact with people with infections and be sure to get vaccinated against the flu and pneumonia. If you can’t avoid large crowds, wear a mask and wash your hands often.